Three crew members from the International Space Station (ISS) have completed their journey back to Earth on Monday, with undocking of their Soyuz MS-02 spacecraft occurring at 3:57 am Eastern, followed by Shane Kimbrough, Sergey Ryzhikov and Andrey Borisenko touching down on the steppes of Kazakhstan at 7:20 am Eastern. Monday’s events are part of a busy period of Visiting Vehicle activities, with the End Of Mission (EOM) events for Soyuz MS-02 reducing the Station to a crew compliment of three people for a short period of time. Although the Soyuz has decades of space flight experience, this was only the second return of the MS variant, which includes the final series of planned upgrades for the veteran spacecraft. The new MS series sports more efficient solar panels, a new Kurs NA approach and docking system weighing less than half that of its predecessor, additional micro-meteoroid debris shielding, and a modified docking and attitude control engine – which will add redundancy during docking and deorbit burns. Preparations for departure began several days ago when the Station adjusted its orbit via a 35.6 firing of thrusters on the Zvezda module. A checkout of the Soyuz was also conducted before the crew packed the vehicle with a few late stow items to take advantage of its limited downmass cargo capability. The crew then participated in a nominal Soyuz Descent Drill, during which they reviewed preliminary undocking and descent data and worked through the descent timeline from Soyuz activation through post-landing activities. They also conducted routine spacesuit checks. The crew then parted ways with their colleagues, with farewell speeches and hatch closures between the Station and the Soyuz. With the crew completing the translation from the Orbital Module (BO) and Descent Module (SA) to strap themselves into their Kazbek couches inside the SA, Soyuz MS-2 undocking took place at 03:57 Eastern. At the time of undocking, Expedition 51 will begin aboard the station under Peggy Whitson’s command. Whitson was only recently granted a three-month extension to her mission on the Station, avoiding a gap in the full crew compliment during a two-month period in the summer. Along with her crewmates Oleg Novitskiy of Roscosmos and Thomas Pesquet of ESA (European Space Agency), the three-person crew will operate the station until the arrival of two new crew members. NASA’s Jack Fischer and Fyodor Yurchikhin of Roscosmos are scheduled to launch April 20 from Baikonur, Kazakhstan. 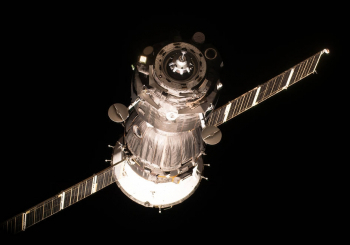 Following undocking – which included another manual test – Soyuz enjoyed a few hours of free flight as it departs from the Station’s neighborhood via two separation burns while the onboard crew prepared for the final aspect of their mission. The deorbit burn occurred at 06:27 Eastern, reducing the Soyuz’s velocity just enough for it to begin the plunge back to Earth. The first milestone was the module separation as the three major elements of the Soyuz spacecraft – the OM, DM and Instrumentation/Propulsion Module (IPM) – are pushed apart via the use of pyrotechnics. 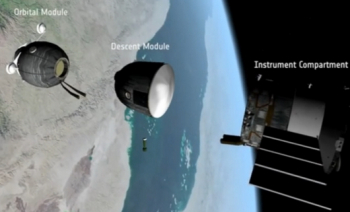 All three modules separate simultaneously – shortly after the deorbit burn was completed – at around 140 km altitude. 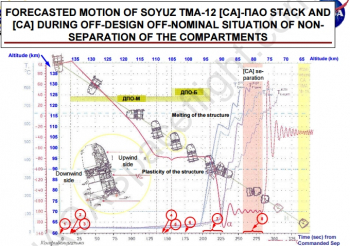 Two ‘off nominal’ re-entries occurred in 2007 and 2008 and were the cause of separation failures on the modules, thus initiating a very stressful return for their three-person crews. Whitson herself had to endure such a return mode during TMA-11’s return to Earth. “The buildup started almost as soon as we transitioned to ballistic. We felt the engines fire to start our 17-degrees-per-second spin, that’s to maintain the capsule’s orientation and give it some stability that way. So we felt that immediately come up. As part of that process, over the next probably minute or so we built up to 8.2 Gs,” Whitson told CBS News in 2008. “It was a pretty fast buildup, and then it stayed, it seemed like at least a minute, I think the profile is only a minute. But of course after six months in zero gravity, that felt like a pretty long minute! As we were coming off the backside and the Gs were decreasing, we leveled off around four, four and a half for a little while and then tailed off after that. So four and a half felt easy after eight. 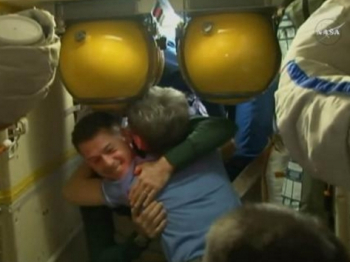 The Soyuz craft then completed the return to terra firma, landing on the steppes of Kazakhstan at around 07:20 Eastern. 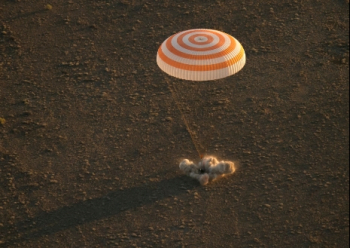 With the vehicle safely back on Earth, ground and air crews converged on the Soyuz to extract the crew from the SA.